I needed a card to celebrate my parents-in-law's golden wedding anniversary! My brothers-in-law and their family are going to hold a party this weekend. My husband, who is a clinical psychologist, is pretty busy because of support activity for Touhoku earthquake victims now. So we are not able to join the party... It's so sorry, but I'll send some gifts along with my card to my parents-in-law. 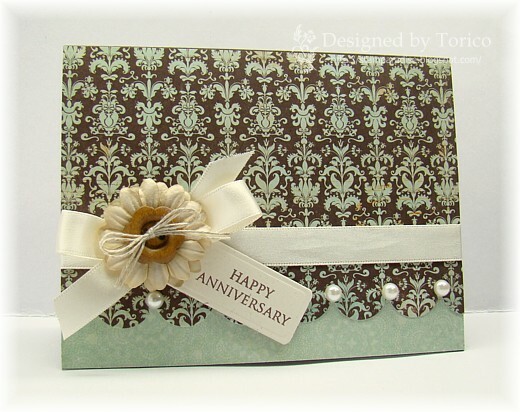 I wanted to make my card simple and elegant, because I know that my mother-in-law prefers such style. I hope they like my card. Here is a card that I made for Get Sketchy Challenge #80. Actually, I made this card for my daughter's friend who is moving to Yokohama next week. 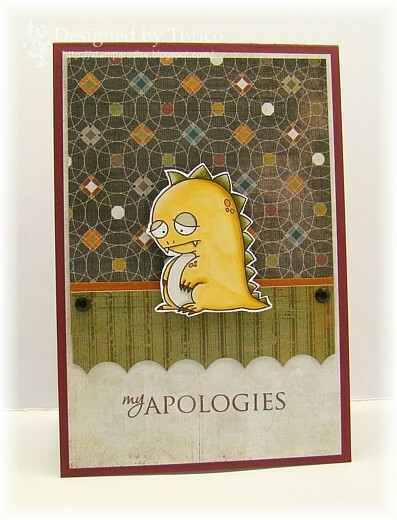 But, my daughter didn't like it and chose another card that I created previously. :(The reason she didn't like this card was the colors on this card. She said that these colors were not appropriate for a girl. Yeah, I have to agree with her. Hello everyone! 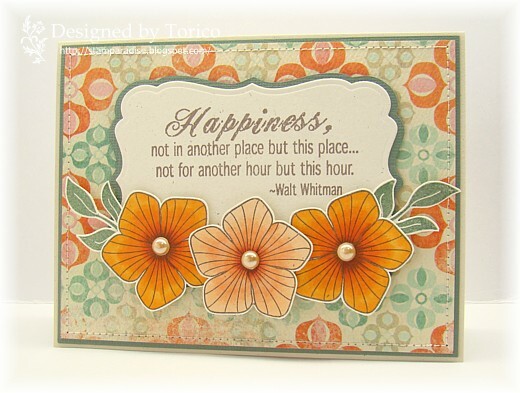 Welcome to Day 3 of this month's TSG Blog Hop Challenges!! Did you come here from Tobi's blog? I hope so. But if not, please start your hop from the TSG blog. 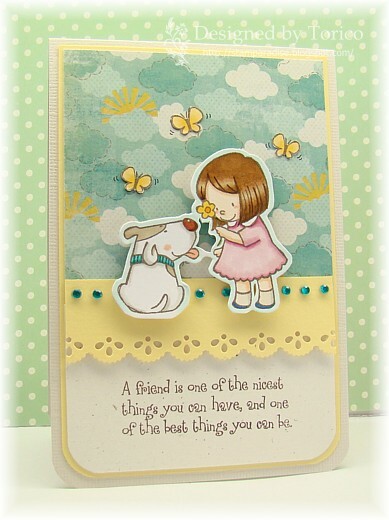 The stamp set we are showing you today is called "My Little Friend". This set features garden gnomes. I receive a part of sales of my TSG stamp sets as commission every month. This month, I'll donate 50% of them to Japanese Red Cross for those who has been affected by Touhoku earthquake. So, I hope many many people love this set!! 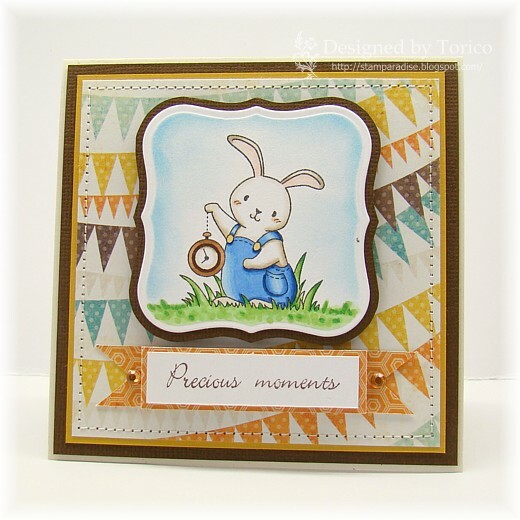 Would you like a chance to win the My Little Friend stamp set? 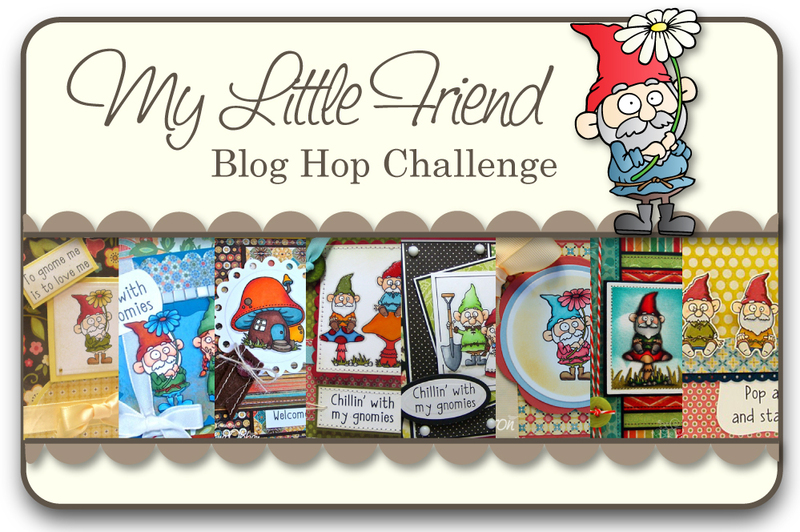 Here’s what you need to do- go to each of the Trendsetter’s Blogs and leave a comment on their My Little Friend Blog Hop Challenge post. After you have finished checking out the eye candy and have left some love, return to the TSG Blog and add your name to the Mr. Linky at the bottom of this Blog Hop Challenge post. A winner will be chosen randomly using a random number generator to receive their very own My Little Friend stamp set. The winner will be announced Saturday (Mar 26th) during the Release Party Chat. Here is the end of today's Blog Hop Challenge. Please head back to the TSG blog and add your name to the Mr. Linky! 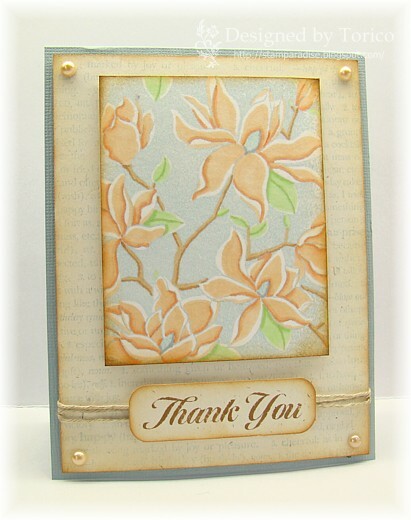 I added two new items to my Etsy shop today, and here is a card using one of them. Thank you for stopping by today. See you soon~!! Hi everyone! I hope you've started a new week safely. Before I'm off, I want to let you know that TSG sneak peeks for this month's release are starting tomorrow! I'll participate in only Thursday, but, please keep your eyes on the TSG blog so that you won't miss a chance to win a new stamp set!! Happy Sunday, everyone! I hope you all are having a wonderful weekend so far. 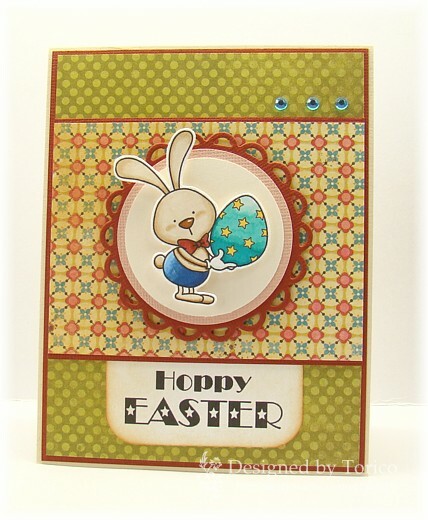 Today's quick post is a card I managed to create today. 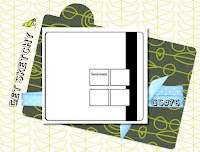 I used one of my new digital stamps. I hope you like this bunny, and please visit my Etsy shop if you have time. I'm donating all of sales on my shop to Japanese Red Cross now (until April 13). The people that have been affected by the Tohoku earthquake need your help. 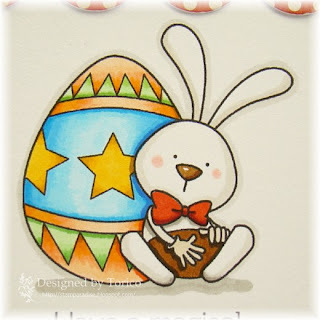 I just popped in to let you know that I've added two new digital stamps featuring Easter Bunny to my Etsy shop. Hop over to the Birdie Brown to see the details! It was a great day for my family today. Because my son finished his elementary school! The third boy from the left is my son, Shunsuke. (Some of his friends say that he looks like Harry Potter. What do you think?? LOL!) They looked so happy and so proud of themselves. Their happy smile made my husband and me happy. I know that the people living in the stricken area are having hard days now, but it was a great relief to us that the graduation ceremony was held safely without being affected by the earthquake. This card is for CPS 209 Sketch Challenge. 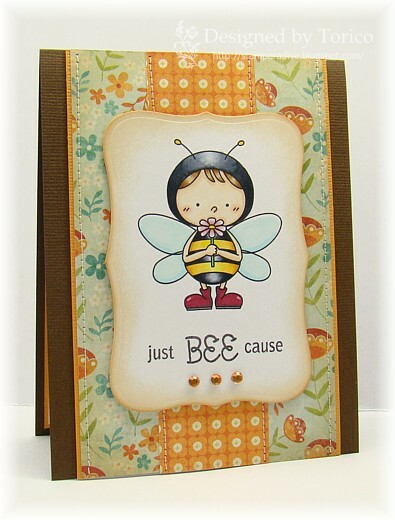 The image is one of my own digi and the sentiment is from Bee Happy set (TSG). Hi everyone! After the large earthquake occurred in Japan last week, I have been able to keep my life normal. But, horrible scenes of Tsunami I saw on TV made me sad, and I couldn't help crying repeatedly... My creative mojo had been quite low, but yesterday, I finally thought that I had to do 'something' for the victims of this disaster. As I said in my previous post, 100% of sales on my Etsy shop will be donated to the Japan Red Cross (until April 13.). 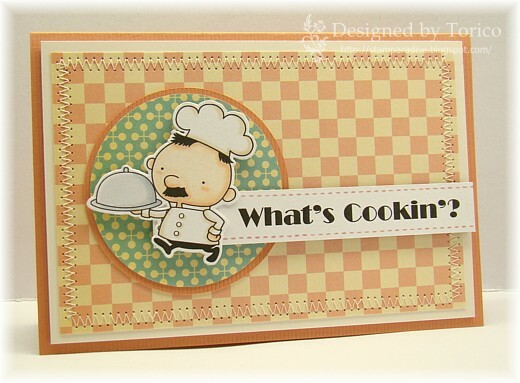 I added two new digital stamps last night, and I'd like to share a card I made with one of them today. I'm going to add some new items to my shop in a few days again. I hope you visit there if you have time. I have no card to share with you today. But I just wanted to let you know that I've decided to donate 100% of every sale on my Etsy shop to earthquake relief funds in Japan from now through April 13. I'm going to add a few more items to my shop in a couple of days. 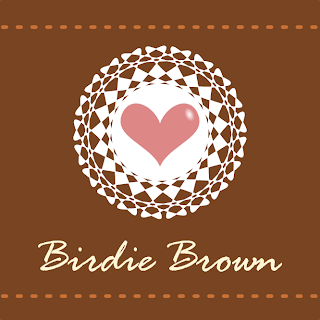 I hope you have time to visit my shop, Birdie Brown. Also, you can donate to the American Red Cross through HERE, to the Japanese Red Cross through HERE. As some of you know, a big earthquake occurred on Japan today. Some of my friends e-mailed me to ask if I'm alright. So I wanted let you all know that I'm totally OK, and my family and our neighbors had no damage, too. But the damage of the stricken area is serious. I'm praying for those who lives in the stricken area... Please pray for them. I'll be back with a card in a few days. Some of you may know that Iwona started a new sketch challenge (Sketchbook Saturday Challenge) on her blog. She shows us her awesome creations and talents day after day, while looking after her little baby! I'm certain that she has over 24 hours per a day. LOL! Anyway, I'm sharing two cards I made using her first sketch. This weeks sketch was easy for me. For the next one, I used my digital stamp, Dino's Life 02. Hi everyone! This is my second post for today. Please scroll down to see a previous post. 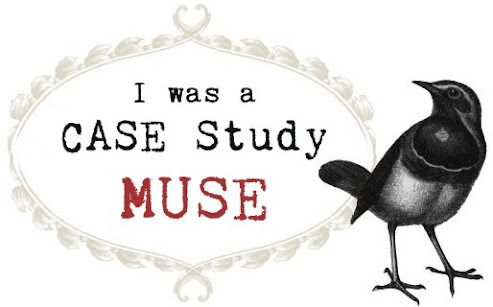 I've just listed up three new digital stamps to my Etsy shop (Birdie Brown) today. I'd like to share a card I made using one of them. I hope you like these dinosaurs:)　I'm entering this card to the challenges below. I was so busy this weekend that I had little time to sit at my computer. As I've not checked some challenge blogs I usually follow, I have to catch up them as soon as possible! I made this card a few days ago, but I didn't have a time to take a photo till today. My inspiration for the layout was last week's CPS sketch (CPS207), though the end result is so different from the original sketch. LOL! For today's card, I used some Hero Arts' stamps I received last week. I made this card for Get Sketchy #76 challenge. 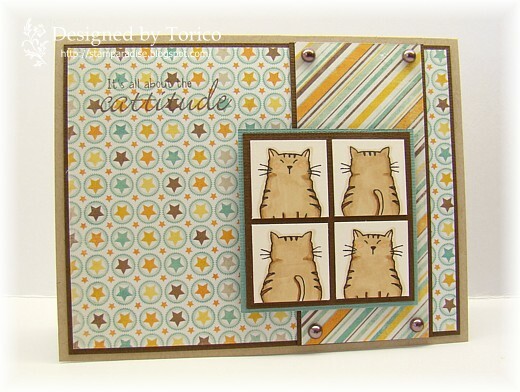 The stamp set I used was Cattitude (TSG). 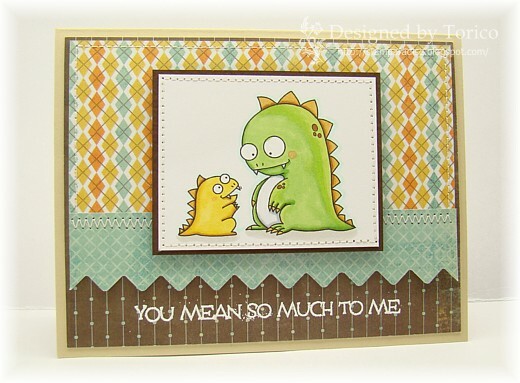 A few day ago, I broke my Big Shot machine... Can you imagine your cardmaking life without a die-cut machine??? Sigh... 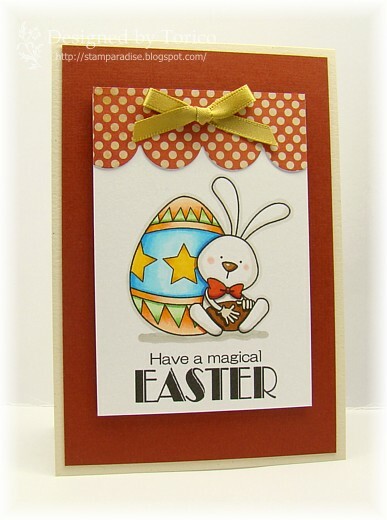 It was lucky that the sketch I used for today's card didn't need to use a die-cut machine. But my creative mojo is low...... Of course, I've already ordered a new one and am waiting for the arrival. Grrrrrrr, I CAN'T wait!!! LOL! Today, I have an exciting news! I decided to have my own Etsy shop to sell my digital stamps, and I've just opened it today!! 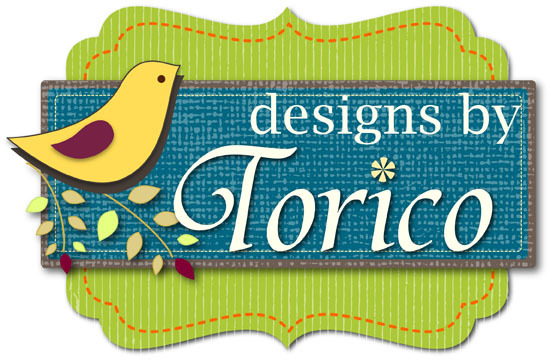 Some of readers of this blog and my another blog (Torico's Digital Gallery) encouraged me to sell my digital images. But I was not sure if my illustrations deserved to do so. 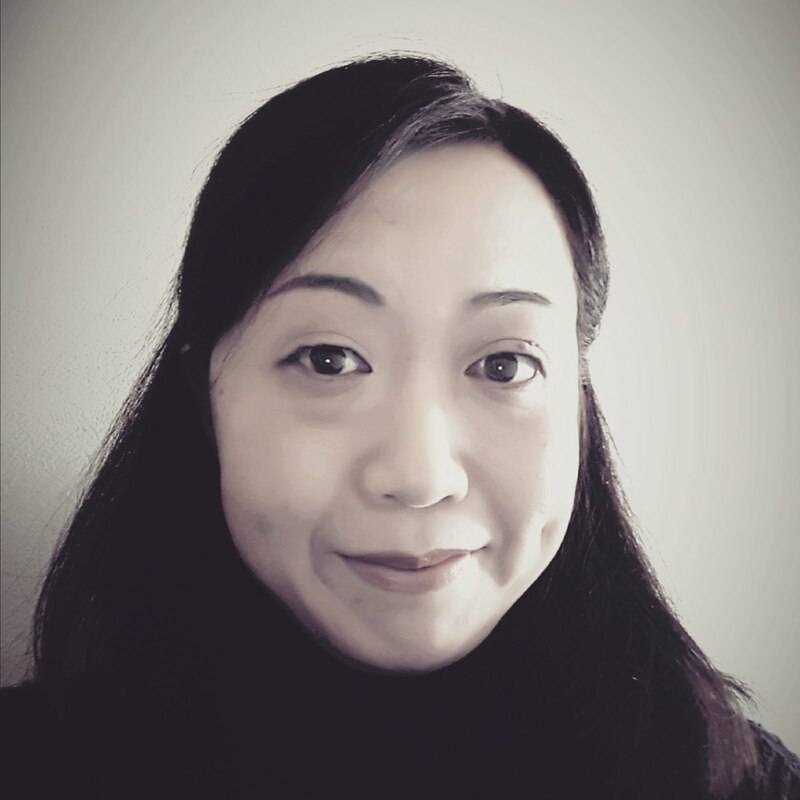 And I was afraid to manage my online shop because I'm not good at English... But, with spring is coming and begining of a new month, I thought it was time to try something new! 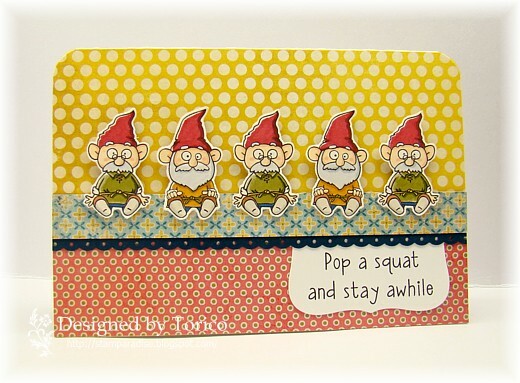 Here is a card I made using one of the digital stamps I listed on my shop.